Could you live for one year without making an impact? Could you lower your carbon footprint? Cut back on electricity, or cut it off all together? Shop only locally, produce no trash, and use only your own two feet for transportation? Colin Beaven and his family did, and he made a movie about it. And that's not it. 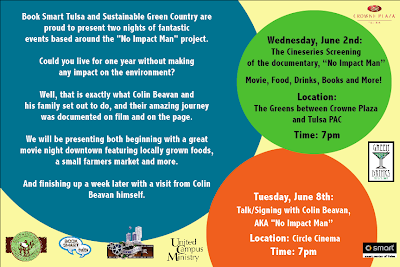 The following week on June 8th at Circle Cinema, the film maker himself (and reportedly his wife too.....rumor has it) will be speaking to Green Drinkers and signing his book. 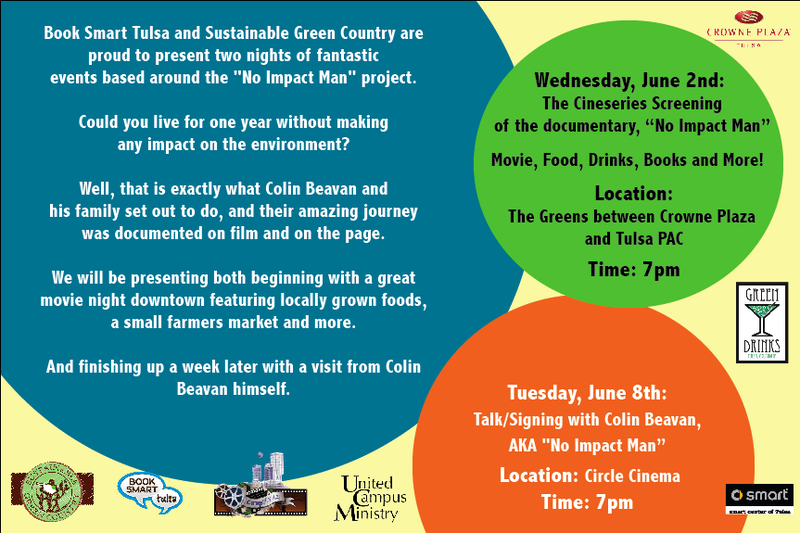 He'll tell us about the No Impact Project where he is challenging people to live carbon light,and to question our lifestyle habits. His book will also be available and there are plenty of refreshments for sale at The Circle. They even sell organic cookies and locally roasted coffee from Topeca. The second half of the year is also packed with more cool events. We are booked through December with events from PSO, Elote, Pro Energy Consultants, The Canebrake, Topeca Coffee, and more. Stay tuned y'all. Good things are happenin' in T Town.